I came across this gem of a recipe on Tastespotting. I tried to ignore it for some reason – I don’t keep peaches regularly, and I don’t really do barbeque that often. I tried to convince myself that I didn’t need to make this sauce. But it nagged at me and finally I caved. I bought peaches specifically for this sauce. The in-laws came in and I didn’t have time to make it, so the peaches sat in the fridge for almost a week. I got them out last night and resolved to make the sauce before the peaches ruined. I still muddled around all day and didn’t start on this until around 1700 hours. This sauce smells excellent when cooking. It would probably make a wonderful surprise as a sweet-savory tart filling of some type, if you or your guests are into that kind of thing. But I’ll take it without complaint as this velvety sauce – on grilled chicken, roasted pork loin or beef roast. Just as a sop sauce, not a barbeque sauce. I don’t know if it was the cultivar or flesh consistency or water content of my peaches, or the fact that I combined the vinegar and bourbon before adding it to the onions and peaches – whatever it was, the sauce did not function as I would have liked as a marinade on chicken breasts, leaving a burned crust on the grill rather than holding to the chicken. (Could have something to do with my grill, too. That aside, sop sauce, thanks.) I doubt it was the absence of the dry mustard, which you’ll notice isn’t in my adaptation. I don’t keep it around, so I didn’t use it. If I’m mistaken and dry mustard has thickening properties I was previously unaware of, please tell me and I will go buy some dry mustard. It would be worth it, since I aim on making this sauce again as soon as I can get more peaches off the tree in the yard. These peaches were store-bought, please don’t stone me (ha ha – terrible pun). Peel peaches by cutting an ‘x’ in the seat, blanching in boiling water for 10-12 seconds and cooling in an ice bath, then slipping the skins off by hand or with a knife. Warm oil in a large saucepan over medium heat. Add onions, 1/2 teaspoon sugar and salt and sauté, stirring occasionally, until onions are soft, about 7-8 minutes. 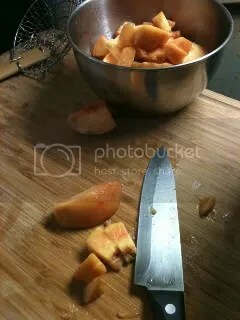 While onions are cooking, remove pits from peaches and chop roughly. Note: skinned, blanched peaches are extremely slippery, and therefore, kinda tricky to handle. Please be sure your knife is sharp or you run the risk of slipping the blade off your peaches and into your hand. Not pleasant. 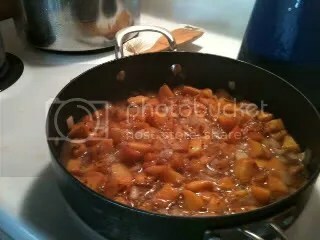 When onions are softened, add the peaches and let them caramelize lightly for 2-3 minutes before adding the remaining ingredients and stirring to coat. Bring to a gentle simmer and let everything cook down, uncovered, until peaches are soft, about 30 minutes. Puree to your desired consistency. If you want to can this and put it away for the colder, less cheery months, one batch will make roughly one and a half pints, or three jelly jars. Can using the water bath method for 10-15 minutes. I recommend serving this over meat (sopped post-cooking, of course) and with Caramelized Red Wine Brussel Sprouts (post forthcoming). You’ll love me later. 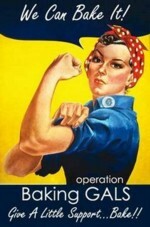 This entry was posted in Cooking, Food and tagged BBQ, Bourbon, Canning, Fruit, Peaches, Sauces, Summer by Kate. Bookmark the permalink. It looks as if it would also work great as a chutney as well! Will let you know. There is still time. Green tomatoes, after all! Your part of the country has such marvelous fare, no matter the time of year. It’s close to persimmon and paw-paw picking time for you! After all that storm, all the tomatoes got gone – bugs, birds and rot got the last of the crop. No more tomatoes here until next year! Check out Joyce’s latest posts on Friends Drift Inn – she’s gone pawpaw crazy! Scroll down to find the recipe youre interested in .Peach Salad with Black Pepper and Mint Peachy Ginger Soup Summer Salsa Peach Omelet Tomato and Peach Chutney Peach-Nectarine Muffins Chilled Peach Soup Spiced Oatmeal Muffins Banana-Peach Shake Baked Peaches Peach Sherbet Vanilla Poached Peaches Blackberry-Peach Muffins Nectarine Salsa Chilled Peach and Nectarine Soup Wine-Soaked Nectarines Peach Muffins Peach Smoothies Chilled Peach Soup Peach and Tomato Salsa Peach Chutney Canned Spiced Peaches Basil-Garlic Chicken Breasts with Peaches Baked Chicken with Peaches Peach Lemon Squares Peach Whirligigs Peaches and Cream Cookies.Peach Salad with Black Pepper and Mint.A perfect accompaniment to grilled meats. It can also be served on top of a bed of arugula or other spicy greens with goat cheese and maybe a handful of roasted and salted almonds. Serves 4-62 1 2 pounds of not-quite-soft peaches sliced 1 4 thick no need to peel 1 8 cup sugar1 2 teaspoon salt1 2 teaspoon freshly ground black pepper add another teaspoon of black pepper for a little kick 2 tablespoons extra-virgin olive oil2 tablespoons fresh mint cut into ribbons Toss the peaches with the sugar if using and the salt. 6 servings 3 1 2 pounds fresh peaches – peeled pitted and chopped1 t ground ginger1 1 3 c heavy cream2 T rumPuree the peaches and ginger together in a food processor or blender.Stir in heavy cream and rum.Chill.Serve cold.Summer Salsa A quick simple recipe utilizing all summer s favorite produce 2 ears fresh corn husked1 large fresh tomato chopped1 large fresh peach pitted and chopped1 red onion chopped6 pepperoncini peppers chopped1 T green chile pepper choppedgarlic salt to tasteBring a large pot of water to a boil.Boil the corn 5 minutes or until kernels are tender.Drain corn cool and cut kernels from cob.In a food processor pulse the other ingredients together until chunky.Transfer to a bowl and mix in the corn.Peach Omelet1 c peeled sliced peaches2 T lemon juice4 slices bacon2 T water6 eggs1 t chopped fresh chives1 4 t salt1 T white sugar1 8 t ground black pepper1 pinch paprikaMix peaches with lemon juice set aside.Place bacon in a large deep skillet.Cook over medium high heat until evenly brown.Drain crumble and set aside.Reserve 1 tablespoons bacon grease in skillet.In a large bowl mix together crumbled bacon water eggs chives salt sugar and black pepper.Reheat bacon grease over medium high heat.When grease is hot pour egg batter into pan.Arrange peach slices on top of egg batter.Cover and cook over medium heat for 1 minute.Uncover and cook until set.Sprinkle with paprika.Let cool slightly before serving.Tomato and Peach Chutneyyields about 8 cups15 tomatoes peeled and chopped5 fresh peaches – peeled pitted and chopped5 red apples – peeled cored and diced4 medium onions diced4 stalks celery diced1 1 2 c distilled white vinegar1 T salt1 c pickling spice wrapped in cheeseclothCombine all ingredients in a large stockpot.Bring to a boil then reduce heat to low and simmer for about 2 hours or until thickened.